How are the judges on the show not 300 pounds? Have you seen how many desserts they eat?? I really don’t know a whole know a lot about British desserts. I am no where near brave enough to be on a competitive cooking show! But I digress, the reason I’m talking about British baking is because scones, yes, scones! The perfect British afternoon tea snack. The thing about scones is that they are not overly sweet and so perfectly delicate. They really are a perfect accompaniment with tea or your morning coffee (as we like to do here in the good old United States!) There are so many variations of scones: sweet, savory, butter, cream, fresh fruit, dried fruit, the possibilities are really endless. As we are fully immersed into autumn, fall flavors are running rampant on Instagram: pumpkin, apple, squash, caramel, cinnamon. But there is one underdog, the under represented flavor: pear. Apple tends to be the star of fall, which don’t get me wrong, I LOVE APPLE! But I also love pear and pear treats are equally delicious. So I wanted to bring this special, beautiful fruit into the light and my first is with these delicious scones. 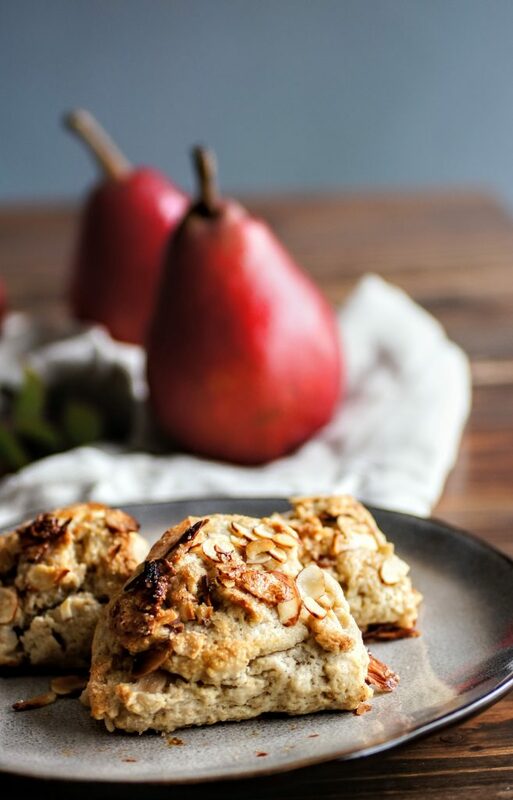 I present to you, Almond Pear Cardamom Scones. Cardamom because well, cinnamon is clearly already paired with apple. I think the cardamom is such a sultry spice that lends itself so well in baked goods, especially with pears. And I love almonds in just about everything. One of my favorite ways to make scones is by using heavy cream versus butter. The heavy cream serves the same purpose as butter and doesn’t require any cutting or grating into your flour, just pour and mix! These are a perfect Thanksgiving breakfast treat as well, check out my tip below about preparing ahead. I hope you enjoy, as always, I love to see your creations, tag me on Instagram @CosettesKitchen or post on my Facebook Page. In a medium bowl, whisk together flour, baking powder, salt, sugar, cardamom and all-spice. Peel and chop pears into 1/2 inch pieces and add to flour mixture. Gently toss together to coat. In a liquid measuring cup, mix together the vanilla extract and 1 1/3 cups cream. Drizzle the cream mixture into the flour mixture, tossing gently until a cohesive dough forms. Add 2-3 more tablespoons of cream if necessary to create a moist, cohesive, but not sticky dough. Dump the dough onto a lightly floured work surface, I also like to work on a slipat or parchment paper. Gently gather and knead the dough into 4 disks using your hands, gently form into 1" thick cohesive rounds. Cut each disk into 4 even triangles. Place 1-inch apart on the prepared baking sheet and pop into freezer for 10-15 minutes*. Remove from freezer and brush the tops with heavy cream and place slivered almonds, brush one more top on top of the almonds and sprinkle with some raw sugar. Place in preheated oven and bake for 15-18 minutes until golden brown on tops and bottoms. Remove from the oven and transfer to cooling rack. Enjoy your delicious treats! **Make ahead. Go through all the steps, except brushing with heavy cream & raw sugar tops. 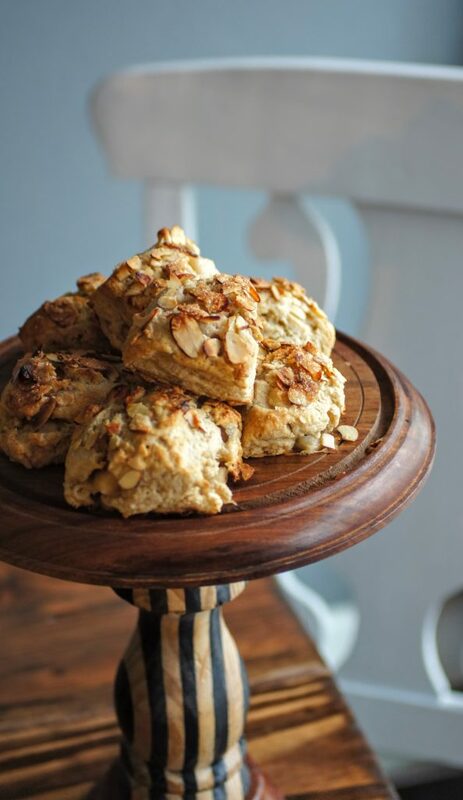 Once you have cut scones and placed almonds on top, you can freeze on the baking sheet until firm then toss them into a zip lock bag. 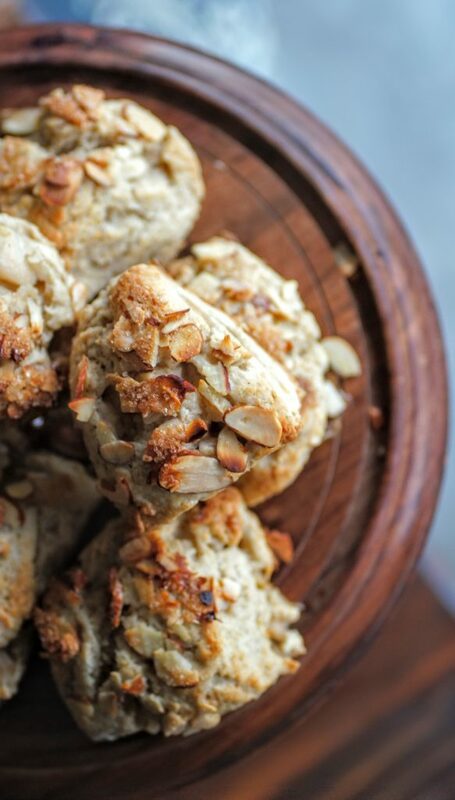 Anytime you want a fresh scone, brush tops with heavy cream and raw sugar, pop into the oven and enjoy! Great before the holidays!